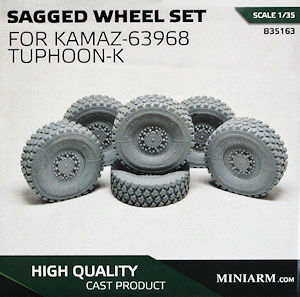 This set of resin replacement wheels from Miniarm is designed for the Takom kit #2082 Russian MRAP Typhoon K and consists of six tyres plus separate two part hubs for each wheel cast in a light grey resin, no instructions are included but it should be pretty straighforward what needs to be done to assembly the wheels and hubs with the wheels then being a straight replacement for the kit vinyl wheel/plastic hubs. 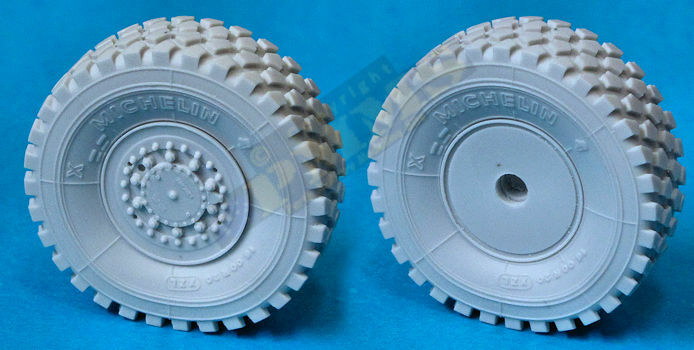 The standard of resin casting is excellent with very well-defined tread pattern and excellent crisp details on the wheel hubs, this detail isn't just a reproduction of the kit wheels but is far more detailed and there are also additional details included, there are still a few minor things to be added such as the outer valve stem but overall they are a marked improvement over the plastic kit hubs. 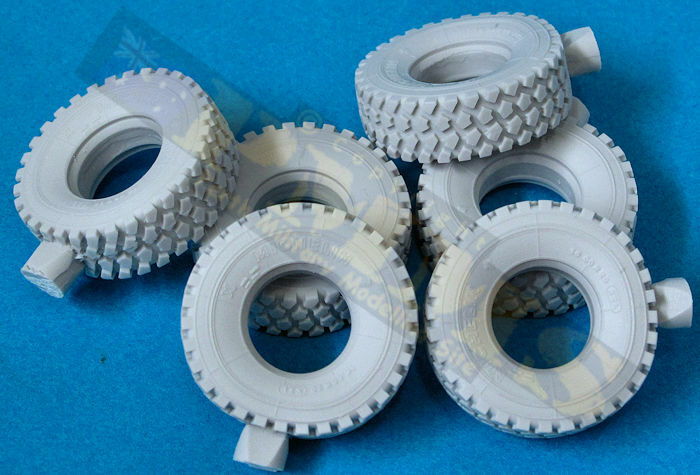 The sidewall embossed detail is also very nicely represented along with clean crisp tread block pattern around the wheels that also include a slight ground contact bulged and flattening effect. There was the occasional very small air holes in the tread pattern on some tyres but they are not really that noticeable as quite small. To two part hubs need to be cut from their casting plugs and fitted to the tyres before the wheels can be added to the kit, click the link below for the assembly process. 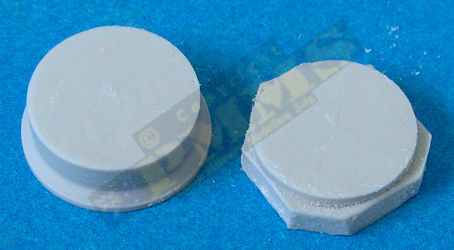 The separate hubs need the large casting plugs cut off using a course razor saw or similar taking the usual precautions with the resin dust as there will be a lot but using a course tooth razor saw will generate larger saw filings and less fine dust. When cutting it's best not to try and cut all the way from one side at once but cut a small depth and then rotate the hub and cut again, this way you will cut more evenly around the hub leaving just a quick trim with a #11 blade the smooth out the cut surface. 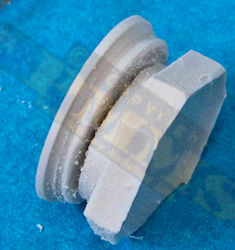 I firstly cut the casting plug with the two hubs in half and trim this close to the hub stubs as this makes turning the hub while cutting easier. The hubs on their casting plug prior to cutting. Separate the two hubs and trim plug. 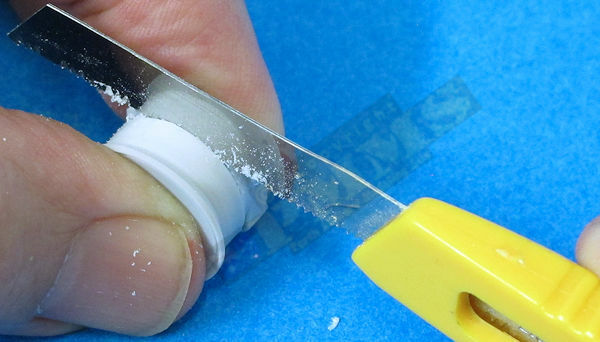 a good course serrated edge that gets through resin quickly leaving larger residue and less fine dust. 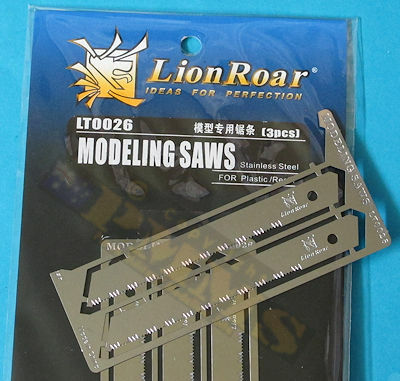 They fit into any of the standard sliding blade cutting handles. Note the cut first made right around the hub and the resulting nice clean and even cut. Repeat the cutting process for the other hub half. The resulting clean cut requiring little if any trimming. The tyre with casting plug removed and the cut hubs ready for assembly. Firstly fit the rear hub half ensuring the rim lip sits evenly around the tyre and then glue in place with Cyanoacrylate. The front hub half is then glued again making sure the align the rim edge evenly. 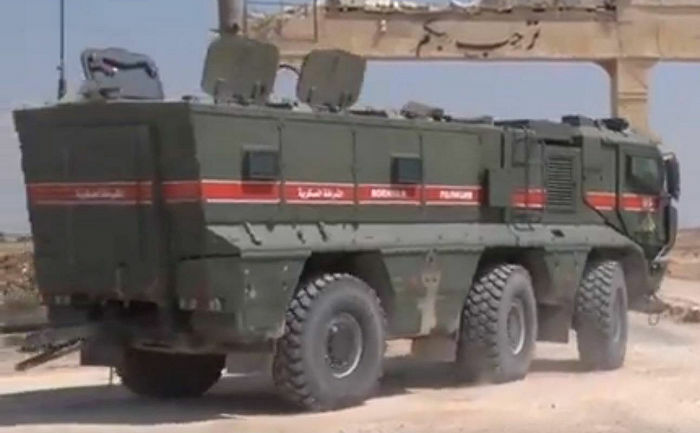 Note the rims are not glued for these images, just sitting inside the tyres. Repeat for all six wheels. The six tyres all have the sidewall embossing in the same position in relation to the ground effect flat section but you can also alter the position of the outer hubs as you fit them to give a different visual effect of not being all the same. 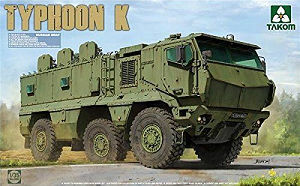 You should also note the treat block pattern is the same orientation on each side of the vehicle and is not mirrored like on US or other modern vehicles, this is correctly depicted on the Miniarm resin tread patterns. 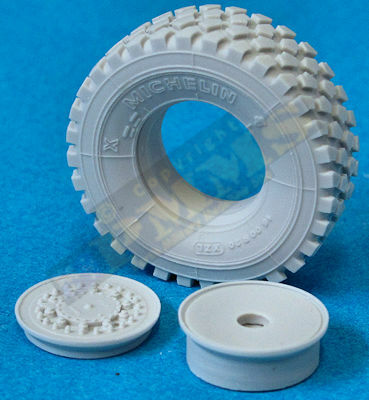 The resin tyres only need the small casting plug removed. 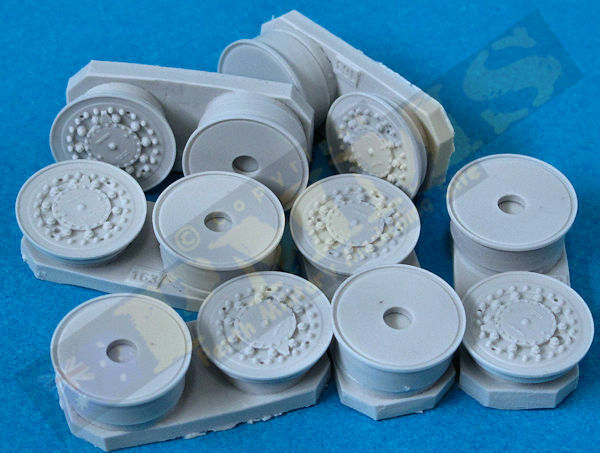 The assembled wheels, note the sidewall embossing in the same position on each wheel front and back. 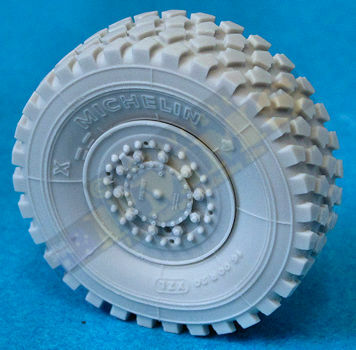 Showing the enhanced detail on the Miniarm wheel hubs and sidewalls. Clean-up of the wheels is very straightforward using a stout pair of clippers to trim the casting plug and your trusty #11 blade to trim the reside, I did mark the letters A,B,C on the rear hubs before trimming the casting plug to make fitting easier. 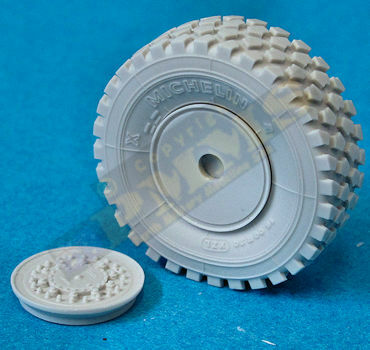 One issue I had with the Takom kit wheels was some of the vinyl tyres were slightly distorted around the centres and this resulted in some unseemly gaps around the hubs and these replacement wheels also overcome that issue as well as improving the detail levels. 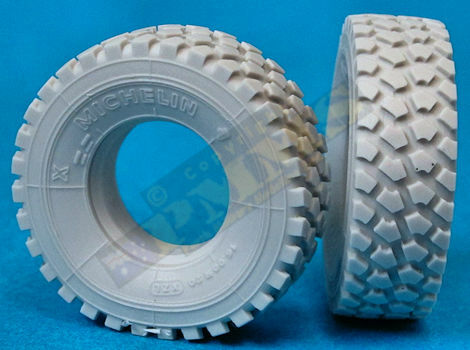 Image showing the tread pattern is the same either side and not mirrored as mentioned above. 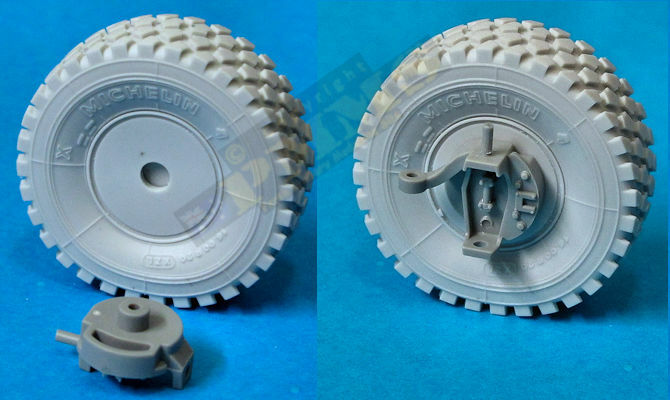 Image showing the first and second wheels steer with just the rear wheels fixed, for those building the Takom kit. Thanks to Azrael Raven for finding this one. 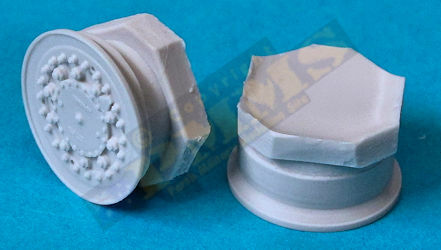 This is a cleanly cast set of replacement wheels and hubs for your Typhoon K although there is a little bit of cutting and assembly needed with the separate hubs but the result gives a marked improvement in detail over the kit wheels to enhance the overall appearance of the kit, fitting is quite straightforward for good replacement for the kit wheels to enhance the detail of just if you don't like vinyl tyres. Thanks to by traumatized credit card and for the review set.